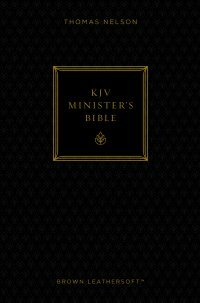 When Thomas Nelson offered to send me a copy of the KJV Minister’s Bible for review, I jumped at the chance thinking how nice it would be to pass it along to a young man recently called to preach. So I review this particular book not as someone accustomed to the pulpit but as a shopper for such a man. The text is printed in Thomas Nelson’s KJV Typeface which was specifically designed for these Bibles. There is nothing but the scripture, no pronunciation guides, no cross-references and not a word of commentary. As I said before, that seems good from a streamlining perspective and I imagine it is designed with the intent that the man of God would be studying with other books at hand and then carrying only this to deliver his message. As for readability, it maybe seems a little bit small and compressed to me. A convenient thumb-tab allows you to open the Bible easily to a real treasure: the complete Nelson’s Ministers Manual has been inserted between the Old and New Testaments, making this one of the most “minister-ready” Bibles I’ve ever come across. Two study guides are included: 30 Days With Jesus, and a One-Year Reading plan. The eight pages of full-color maps are helpful, as well.